Product Code: ATD Engineered to eliminate deficiencies common to all conventional petroleum ATFs, AMSOIL Torque-Drive provides superior performance and protection against thermal and oxidative degradation, sludge and varnish formation, viscosity shear down, cold-temperature oil thickening, poor friction stability, high component wear and shortened oil life. Automatic transmission operating expenses can be directly linked to transmission fluid quality. Poor-quality oils need frequent changes and reduce the effective service life of transmissions. Delivering maximum oxidation resistance, wear control and friction performance, AMSOIL Torque-Drive extends lubricant life and provides protection beyond that possible from conventional ATFs. 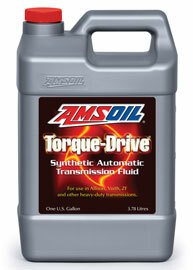 Immediate financial benefits are possible upon the installation of AMSOIL Torque-Drive. Vehicles stay on the road longer, unnecessary labor and maintenance costs are reduced, and the return on costly transmission investments is maximized. Hot weather and operating conditions are no excuse for poor transmission reliability. By delivering a slower than normal oxidation rate, AMSOIL Torque-Drive® prevents sludge that blocks small valves, prevents varnish that restricts component movement and reduces oil thickening that slows down shift times. AMSOIL Torque-Drive® lasts longer than conventional ATFs, protects better than conventional ATFs and extends transmission life beyond that possible with conventional ATFs. Conventional automatic transmission fluids use petroleum oils with viscosity index (VI) improvers added to increase the oil's operational temperature range. Over time, VI improvers shear down, promoting premature wear by leaving only a thin base oil to protect vital transmission components. AMSOIL Torque-Drive® does not contain VI improvers, which means no VI improver shear down regardless of the operating environment. The unmatched film strength of AMSOIL Torque-Drive® prevents wear, significantly increasing the transmission service life. Oxidation by-products destroy the sensitive friction characteristics of transmission fluids, resulting in the rapid degradation of shift quality. The thermal and oxidative stability inherent in AMSOIL Torque-Drive® assures consistent, smooth clutch engagement with no harsh shifting throughout the life of the fluid. AMSOIL Torque-Drive® maintains proper coefficients of friction, prevents clutch glazing and prevents elongated shift times.